I made this piece and then liked it so much I kept it instead of selling it. 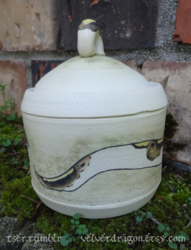 The outside design is underglaze and the jar has luscious satin white glaze on the inside (shown in this tumblr post). It currently sits empty on my shelf next to my crested gecko enclosures. I have no idea what to put in it. I actually ran into disaster making it, but you can't tell. I painted the outside first because I handle pieces a LOT while doing the design work, so if I had glazed the inside I would've mucked it all up. I had the outside which took hours of work, then covered it with plastic and masked the top, and glazed the inside. 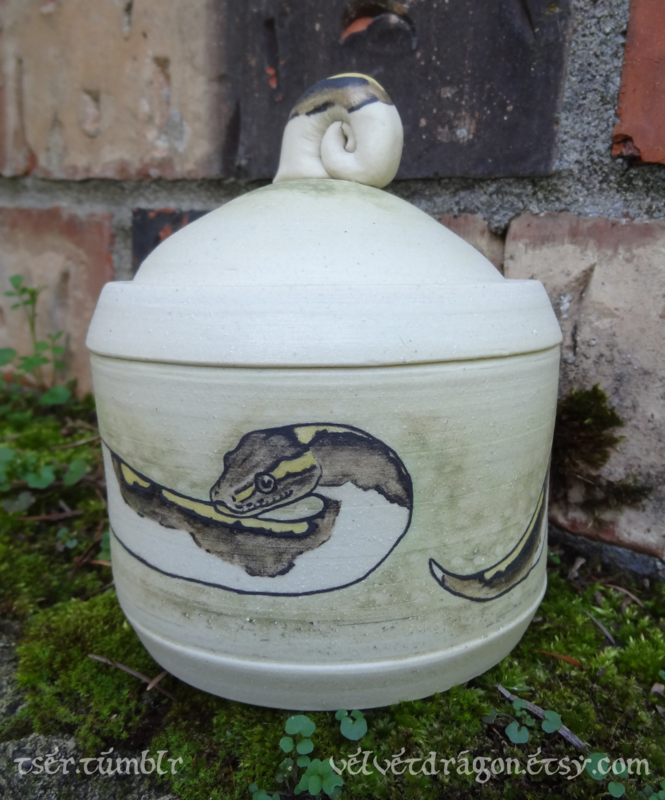 UNFORTUNATELY my masking didn't create a proper seal, and the glaze ran down the outside of the jar all over my underglaze work. Amazingly I was able to wipe and scrape all the glaze off, and re-underglaze the areas it had destroyed, and it was salvageable. That may be one reason I'm so attached to it.